Luckily, Tiny Prints has THE cutest layouts, designs & card shapes. 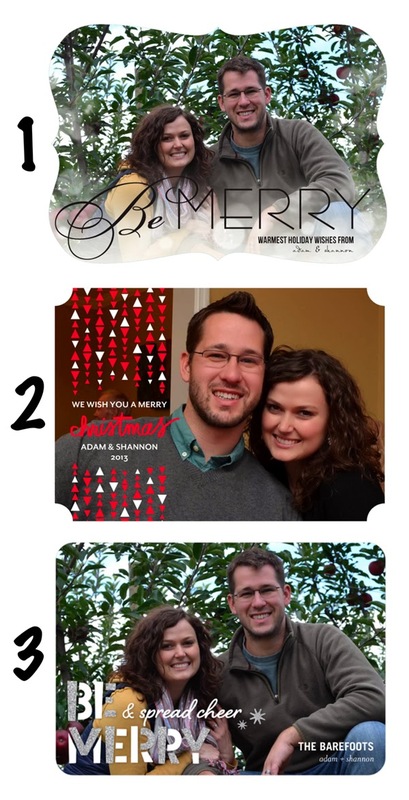 I think I browsed through all 701 of their "holiday card" options before mocking up these 3 options below (pssst...they also have a wide variety of christmas cards, holiday party invites & gifts). My favorite thing about Tiny Prints is that their program is so easy to use. You simply select the style you like, upload your picture(s), personalize your shape & colors and you're ready to order. They also have adorable customizable envelopes to make your cards even more fun. Please help me select which one of these cards I should send out this year by taking the poll below. It just takes one click. After you're done voting, head on over to Tiny Prints to start customizing your own holiday cards. Which Christmas card is your favorite? #1 is my favourite!! they are all super cute though!